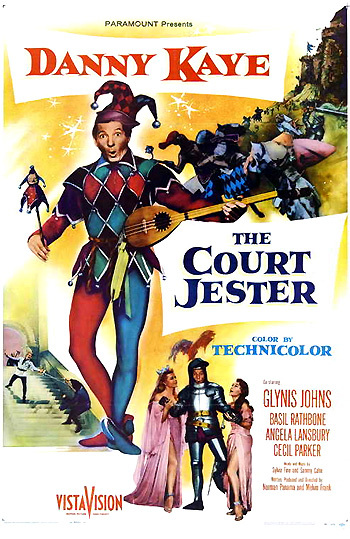 The Court Jester (1955) is Paramount's Vista-Vision comedy film starring Danny Kaye (in his best-known performance). It is a classic, high-energy musical spoof of the dashing adventure films in Hollywood's Golden Age of Swashbucklers (many of which starred Errol Flynn). From the writing/directing/producing team of Melvin Frank and Norman Panama, the musical costume comedy set in medieval times features some of motion picture history's best comedic wordplay, in its story revolving around mistaken identity. It blends numerous genres together: musical, adventure-swashbuckler, comedy (screwball), and live-action cartoon. Kaye stars as acrobat Hubert Hawkins, one of the "Merry Men" of The Black Fox (Edward Ashley), a Robin Hood-esque or Zorro-like hero/outlaw who wishes to ensure that the rightful royal heir to the throne (a baby with a purple pimpernel birthmark on its behind) is put there instead of a usurper. Adept at impersonation, Hawkins winds up pretending to be Giacomo (John Carradine) - the new court jester of the royal usurper King Roderick the First (Cecil Parker), in order to enter Roderick's palace. Complications arise when it's revealed that unbeknownst to Hawkins, Giacomo is also a skilled assassin, hired by the scheming Sir Ravenhurst (Basil Rathbone) to kill Roderick and acquire the throne for himself. Complicating matters even further is the film's romantic sub-plot. Hawkins is hypnotized (by a finger snap) into wooing the King's daughter - Princess Gwendolyn (Angela Lansbury) by her evil-eyed lady in waiting Griselda (Mildred Natwick), as she is being forced by her father into a politically-important marriage with grim Sir Griswold of the North (Robert Middleton). - The film featured some great musical production numbers, such as "They'll Never Outfox the Fox" and "The Maladjusted Jester", including one amusing scene where a chorus line of armored knights surround Hawkins in a song-and-dance number. Hubert Hawkins: Eh... the Duke do? Hubert Hawkins: Oh, the Doge! King Roderick: Eh. Well what did the Doge do? Hubert Hawkins: The Doge do? Hubert Hawkins: Well, uh, the Doge did what the Doge does. Eh, uh, when the Doge does his duty to the Duke, that is. King Roderick: What? What's that? Hubert Hawkins: Oh, it's very simple, sire. When the Doge did his duty and the Duke didn't, that's when the Duchess did the dirt to the Duke with the Doge. Hubert Hawkins: Oh, they all did, sire. There they were in the dark; the Duke with his dagger, the Doge with his dart, Duchess with her dirk. Hubert Hawkins: Yes! The Duchess dove at the Duke just when the Duke dove at the Doge. Now the Duke ducked, the Doge dodged, and the Duchess didn't. So the Duke got the Duchess, the Duchess got the Doge, and the Doge got the Duke! King Roderick: Curious. I... I... hm? What? What's that? All I heard was that the Duchess had a siege of rheumatism. She's 83, you know. - Its most famous sequence was the pre-joust toast (between Hawkins and Sir Griswold), before which Griselda warns Hawkins about the location of poison in the toast vessel, with the famous tongue-twisting "Vessel with the Pestle" dialogue ("The pellet with the poison's in the flagon with the dragon; the vessel with the pestle has the brew that is true.") At first, "the pellet with the poison's in the vessel with the pestle; the chalice from the palace has the brew that is true! ", but then one of the containers breaks, so now the flagon with the dragon has the pellet with the poison. Hubert Hawkins: I've got it! I've got it! The pellet with the poison's in the vessel with the pestle; the chalice from the palace has the brew that is true! Right? Hubert Hawkins: They broke the chalice from the palace? Hubert Hawkins: Flagon with a dragon. Hubert Hawkins: But did you put the pellet with the poison in the vessel with the pestle? Hubert Hawkins: The pellet with the poison's in the flagon with the dragon; the vessel with the pestle has the brew that is true.